Web-based training Workshops and Courses. 8 hours of weekly "live" Chat room sessions with guest experts, UltraNet Associates & your friendly UltraNet publisher! Subscription to "The Leader's Edge" - our monthly newsletter focuses on the very best-in-class solutions, resources, tools and services for leaders and is delivered directly to your private Inbox. 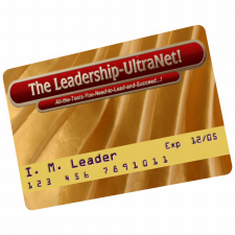 Pick up Your "UltraNet Goodies!" - our monthly Specials, Sales and FREE Give-Aways - great bargins and gifts of software, books, reports, educational courses and services, self-help and professional development information products and tools - these Goodies are a small gesture of thanks for your continued membership and as such constitutes our token of appreciation for your business. Automatically scan and clean all and any infected files when you upload or download them! You have the opportunity to enroll in special 60-minute Webinars and Web-Conferences - where you can go on the "Leader's Journey of Self-Discovery" or learn how to "Add Substantial Value to All Your Leadership Contributions" - Read our Catalog!